The competition will run in 2 lanes of the junior session (7.45-8.45) and the senior session (8.45-9.45). The competition is aimed at swimmers who are able to legally swim a 100 Individual Medley race. Swimmers will be judged on their start, stroke technique for all strokes, turn skills and their finish. 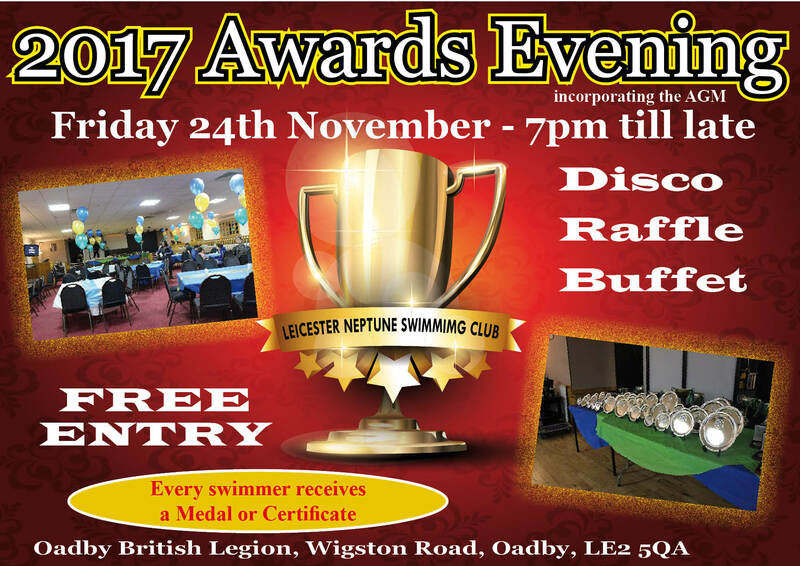 Please note that this competition is not aimed at beginner swimmers since there is only a limited time available on the night. Training will take place as normal in 2 lanes of the main pool and in the small pool. Swimmers competing will be withdrawn from their training in small groups. Swimmers who do not normally swim on a Friday are welcome to compete. There will be a list at the desk – all swimmers wishing to enter should sign up there. The 7pm development session will be training as normal. There will be NO Training at Parklands . There will be no training at Evington and Parklands on Friday 24th November 2017 due to the LNSC Awards evening (See below for details). Starts : 7:00 pm prompt. Please note: There will be Time Trials at Evington Leisure Centre on Friday 10th November between 19.00 – 20.45hrs.